I just finished up an amazing trip to the Dolomites in Italy. I’ve heard about them for years, but this was the first time I had the opportunity to go. I ended up spending a week there starting on Thanksgiving and it has jumped into my top 3 all-time best places to visit, especially Tre Cime! 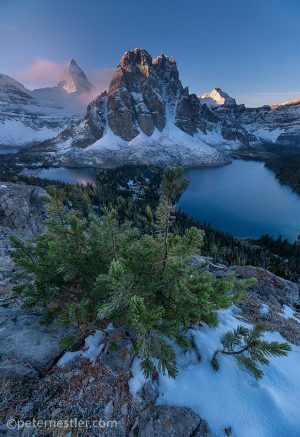 Most people like to visit this area in the summer or fall since hiking in snow is a bit tenuous at best. Me? I love photographing mountains with snow on them. Having grown up in Alaska, I have always liked the look of snow capped mountains. It almost seems sinful to have them barren. That’s just my opinion. Anyway, below is a quick recap of my first day of adventure in the beautiful Dolomites! 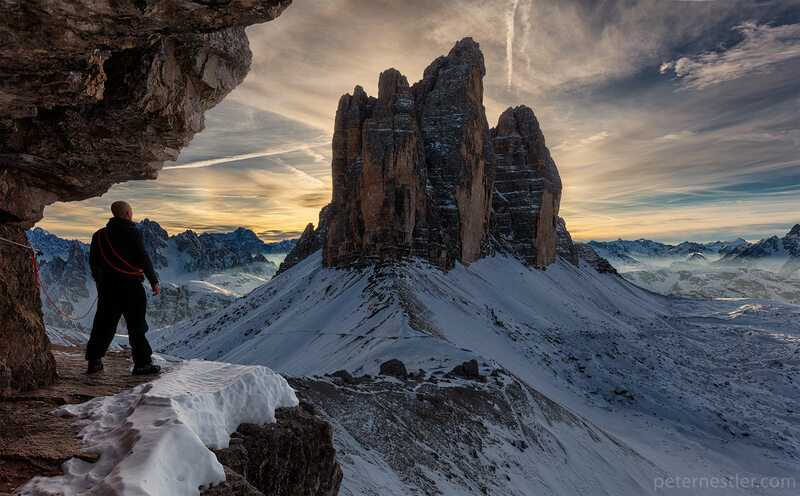 If you ever get the chance to visit Tre Cime in the Dolomites, take it. 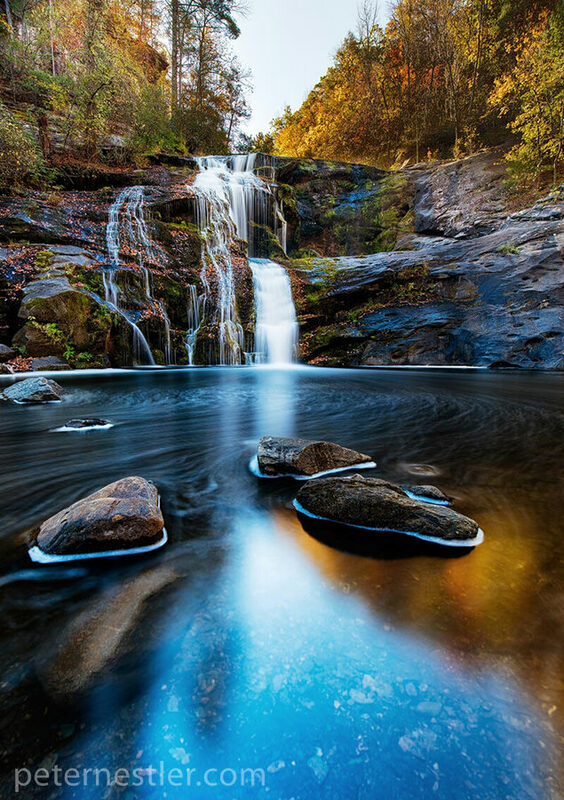 This is easily one of the most gorgeous parks on earth. I spent 18 hours here on Thanksgiving and could probably have spent the entire week here with no regrets. Depending on how busy it is, your mileage may vary. I awoke at the unreasonable hour of 2am to start this adventure. 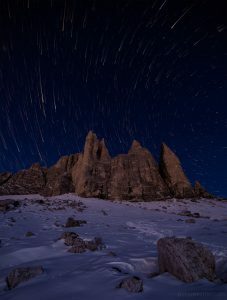 My goal during the trip was to shoot a couple starscape images and this was the only day without clouds in the forecast. I would have very much preferred doing this on another day, but you gotta work with mother nature’s calendar. Tip #1 – check the weather! I had about a 50 minute drive from the apartment I rented. Having never been to this location before, I was a little unsure of exactly how far I would have to hike to get where I wanted to be. Most reports had it listed as 6km of hiking uphill. I figured this would take about 1.5 – 2 hours so I should be able to get a good image before twilight began. Driving on the slightly snowy roads in a fiat 500 turned out to be an adventure in itself. I won’t go into that here, but it was exciting at times. With 5km left on the drive I came to the primary entrance location for Tre Cime. This is where things went off script for me. All the gates were closed and I couldn’t drive to where I was supposed to go. Apparently, this isn’t the most popular spot to go in winter. I was a little worried that my starscape aspirations were shot since there was no way I could do 11km of hiking in my allotted time. I parked my car in an area that looked like it was for cars only. Italian road signs are a bit different from US ones, this lead to some confusion on my trip, but the car was still there when I got back so I got this one right. There’s normally a per vehicle fee to enter, but since I was walking (and all the pay stations were closed) I just cruised through. For full disclosure: I could have opened the far left gate since it was not locked. This would have saved me about 1km of walking, but I was concerned that someone would lock it while I was inside and would not have been able to get out. It looks like there are a couple private residences inside the park so they probably use that entrance. It was open when I returned and it wouldn’t have been an issue to have driven up a bit further. Use that info as you will. The road was relatively flat and driveable for the first km. At this point the road forked and the uphill section was blocked off by a barricade so cars would not drive up it. I could see why as I hiked up the hill. It was steep (15-20% grade) and covered in snow and ice. My little fiat would never have made it up. When I got back down, someone had parked at this barricade so that would have been a possibility. One thing I never leave without are some good flashlights! I always have 1 or 2 handheld lights (good for light painting as well) and a headlamp. I put one of the flashlights to good use as I wandered up the snow packed road. It was a tiring walk up the steep grade, but I made good time. The primary parking area was quite a relief to finally reach. I quickly hopped onto the trail and hoped that it wouldn’t be too far to get somewhere with a decent composition. As it turns out, it was only about 1km from here to where I actually wanted to go! I could actually pull off my early morning starscape. 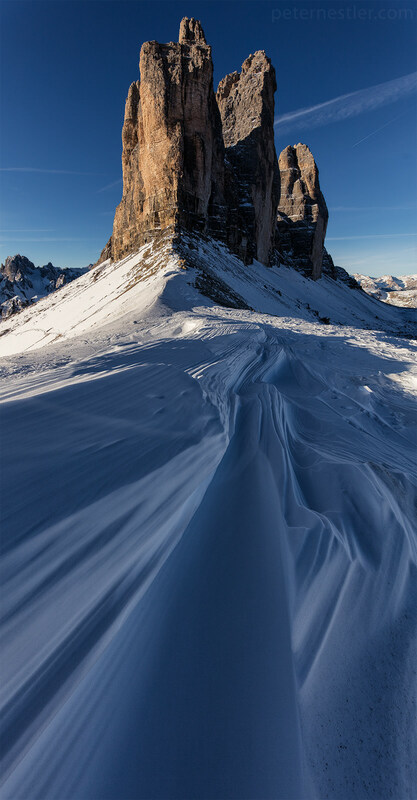 One of the cool features of the Italian Dolomites are the spiky peaks. 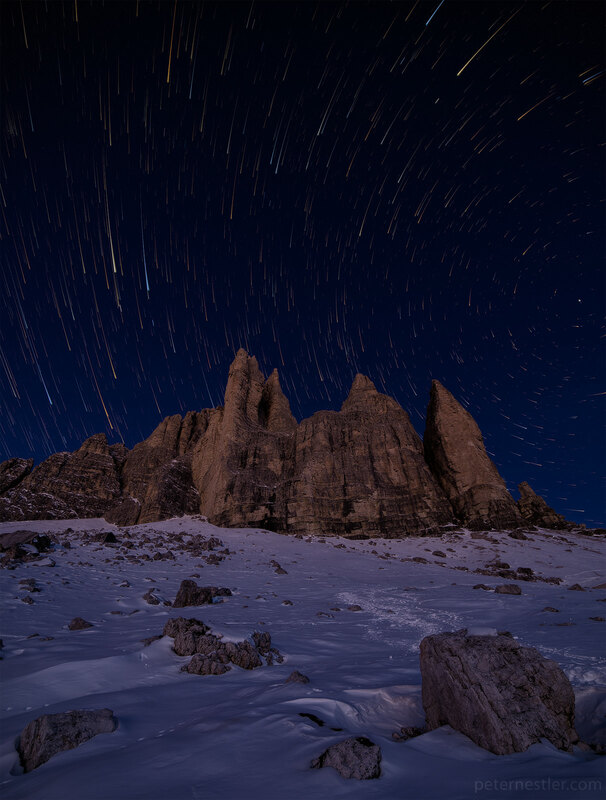 Tre Cime has a very distinctive set that is iconic and beautiful to behold. Since I really couldn’t see much in the dark, I was really guessing when I setup for the starscape. PhotoPills gave me a good idea where polaris was located (which you can see on the right side of the image). I would have loved to get it centered above the mountains, but that wasn’t going to happen without more time. To get the faded tail look in a starscape image you need to fire off multiple frames. This image used 200 x 15 second images. It turned out pretty good, but my attention was quickly shifted to the sunrise that was just beginning behind me. I ran down the trail a little ways to take a blue hour shot of a small church I had passed on the way up. I really love how this image turned out. There was some beautiful light on the mountain to the right and the sun was lighting up the sky on the left. I then watched one of the top 10 best sunrises I’ve ever seen! Sadly, I did not get any pictures of that since I was waist deep in a pile of snow and couldn’t really get anywhere decent. Sometimes it’s totally worth just watching those moments! I crawled through this cave and came to a cliff that wound around the side of a hill. There was a wire bolted into the cliff so I pulled out my trusty safety line and clipped into the wire. As I walked around I found a gorgeous view of this iconic spot in the Dolomites. Since It was still quite a while until sunset I headed back into the cave to take a nap. The warmest it ever reached all day was -1 so I was a bit cold laying on the rock floor for a couple hours. After some fitful napping where my toes felt like they would fall off, it was time. I headed back outside and was able to take one of the best pictures of my career. I shot a number of pictures with slightly different angles before I decided to stand in the frame. Rarely do I like having people in my pictures, but this was one of those exceptions. Numerous poses were tried to fit the epicness of the scene, but they all looked a bit ridiculous. I settled on a basic standing pose and tried to look as not-stupid as possible. I really love how this one turned out. This is where things get interesting. I had an awesome picture, but really wanted more! I rushed around the cliff and crawled back through the cave to head closer to the mountain. 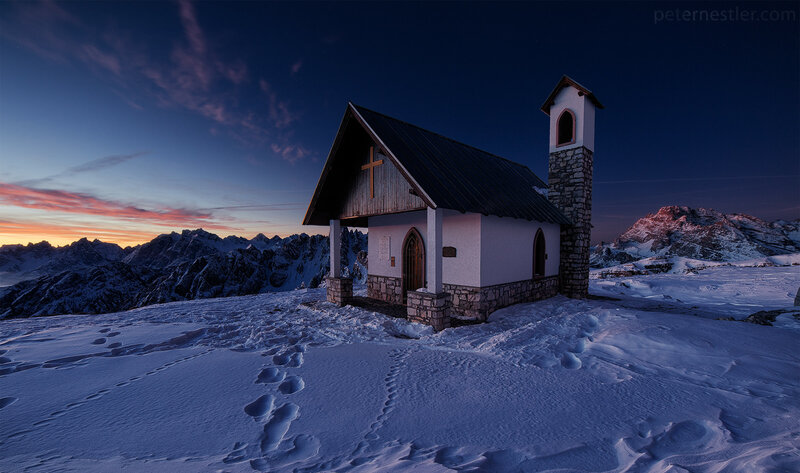 Rushing down a steep hill with icy snow isn’t the wisest of decisions, but sometimes it is necessary. I grabbed some more frames before settling on one for my blue hour/second starscape image. Earlier in the day I found some awesome wind swept snow that almost looked like it was moving. I knew this was the look I wanted for my star shot. Unfortunately, there was a low layer of clouds that stuck around so it would not be as clear as my morning shot. The other problem, the moon was out which makes shooting stars a bit difficult. It did work out since the moonlight helped with my foreground giving me some dramatic shadows. 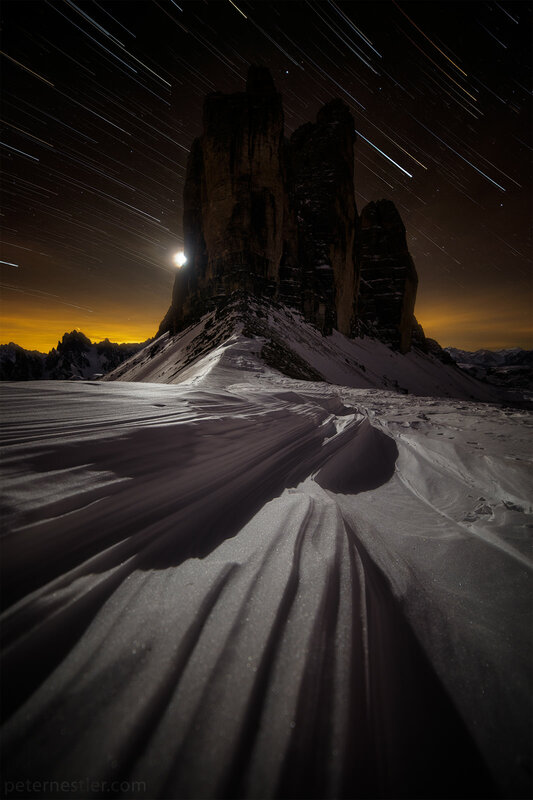 I had to wait around for the moon to go behind Tre Cime before I could start the actual starscape. I spent my time, quite literally, running back and forth on the snow behind the camera trying to stay warm. 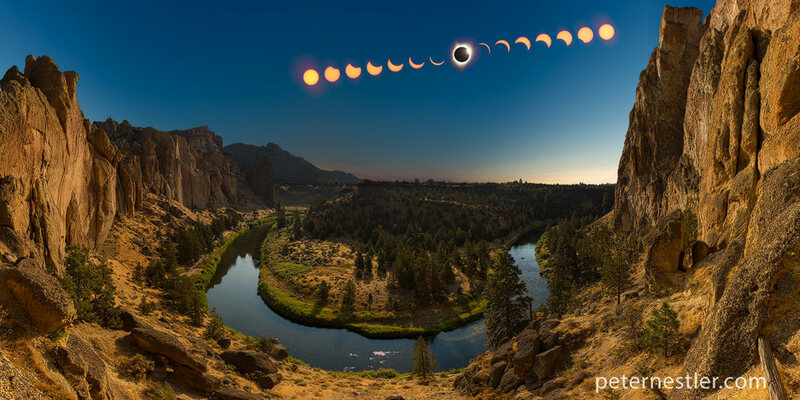 Eventually the moon moved out of frame and I started a 250 image cycle that turned into this image. With all the picture taking out of the way I now had to hike back to my car. It was a much easier hike down hill in the dark, but 6km still takes a while. My final problem of this long day related to the snow I had parked on. I couldn’t get my car to move! I had snow chains in the back, but really hate putting them on. Thankfully my fiat was front wheel drive so I was able to rock back and forth and eventually get out of there. I got back to my apartment around 11pm so it was a very long day. I highly recommend checking Tre Cime di Lavaredo out whenever you get the chance! 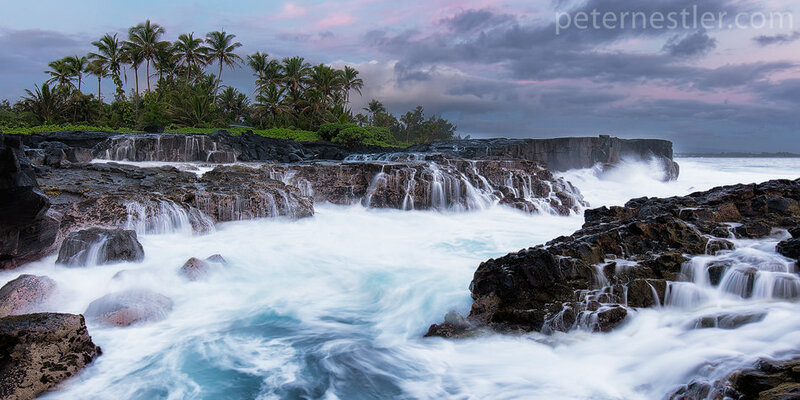 It’s an awesome location and I look forward to going back sometime soon!